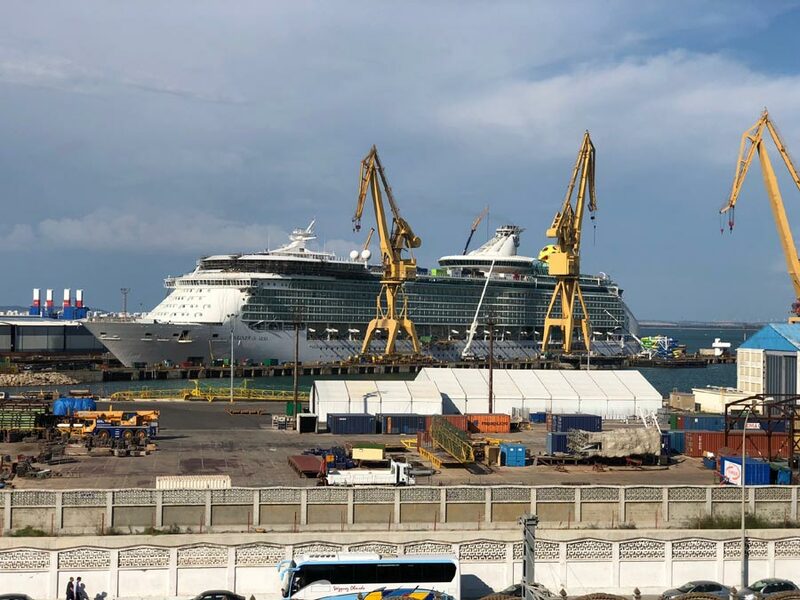 We have another newly updated cruise ship to look forward to and to excite us further we’ve got some Mariner of the Seas photos during her major dry dock in Cadiz, Spain. The vessel will be showcasing all the new features and enhancements in June 2018. 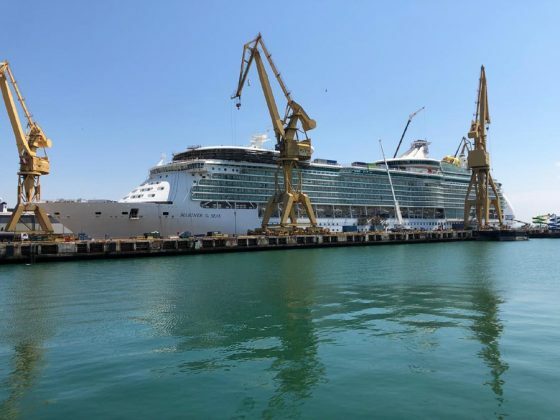 Royal Caribbean has released a batch of latest Mariner of the Seas photos during her major renovation which is taking place in Cadiz, Spain. The cruise line is investing a total of $90 Million in amping up the offerings on the Voyager class cruise ship. Some of the biggest new additions to Mariner of the Seas is Sky Pad, a new bungee jump trampoline experience located at the ships aft on the open deck. 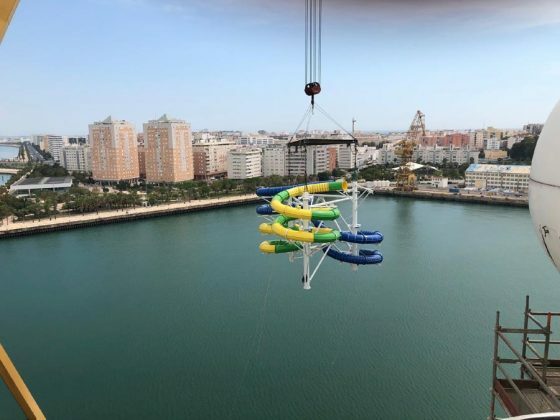 The feature includes virtual reality and can be enjoyed during the day and at night. 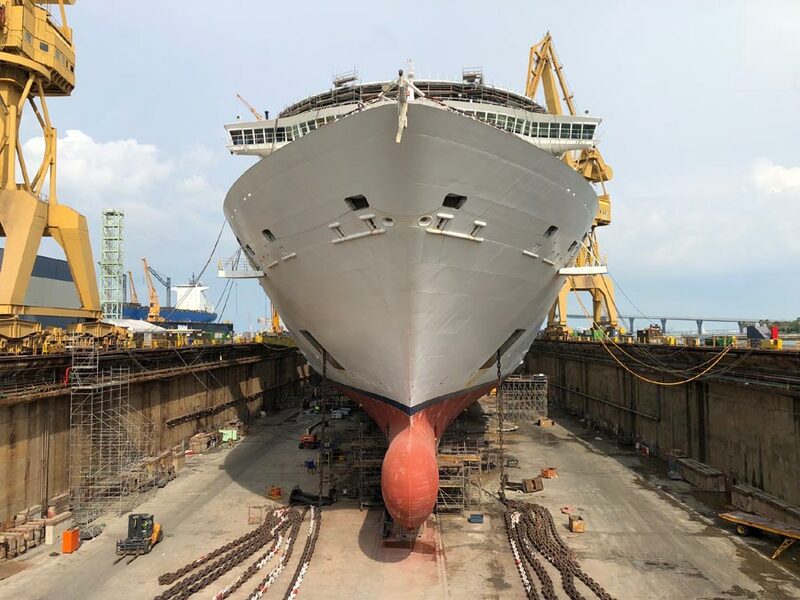 You’ll be able to get a glimpse of this innovative new Sky Pad during her dry dock in one of the photos below. 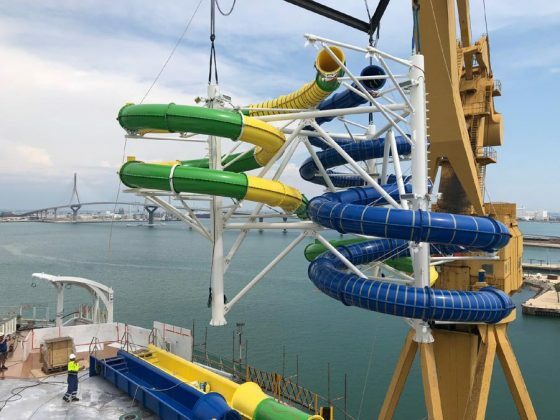 Other new features include Laser Tag, The Bamboo Room and Playmakers Sports Bar & Arcade. 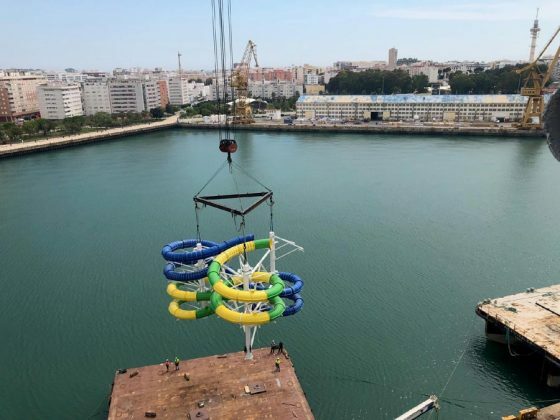 Mariner of the Seas isn’t looking so good at the moment as workers are onboard building the new features which guests are going to start enjoying very soon. In addition to the new offerings, work is usually done in other areas including cabins, a new coat of paint on the hull, general technical maintenance, decor and more. 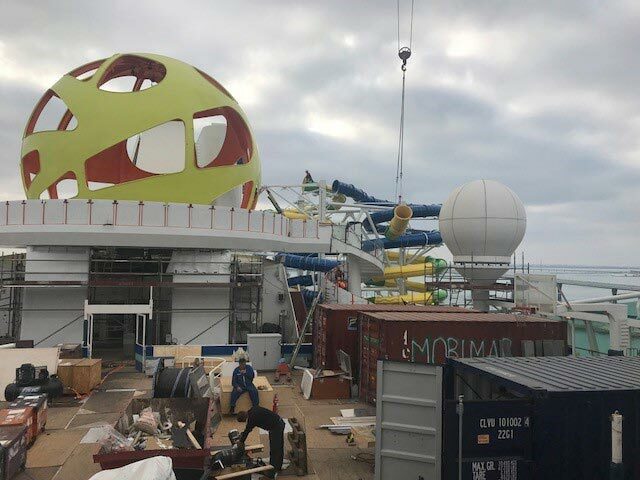 Around half of crew members will stay onboard as they work on making adjustments to their own departments. The crew will make sure the Royal Caribbean cruise ship is ready for when Mariner of the Seas debuts her fresh look in June. The dry dock is part of Royal Caribbean’s Royal Amplified program where an investment of $900 Million going into upgrading ten ships over a four year period. 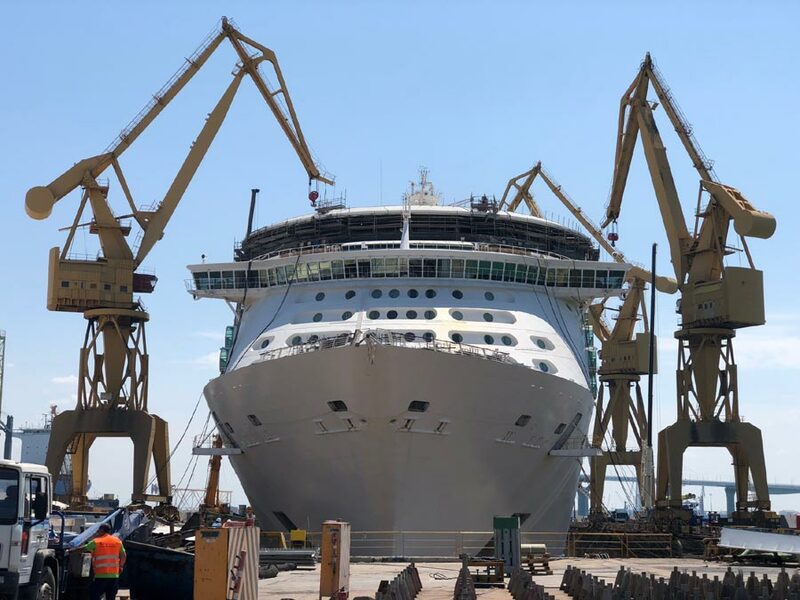 Just days ago we posted about Independence of the Seas receiving her new Sky Pad feature. Navigator of the Seas is the next ship to get a makeover in 2019. 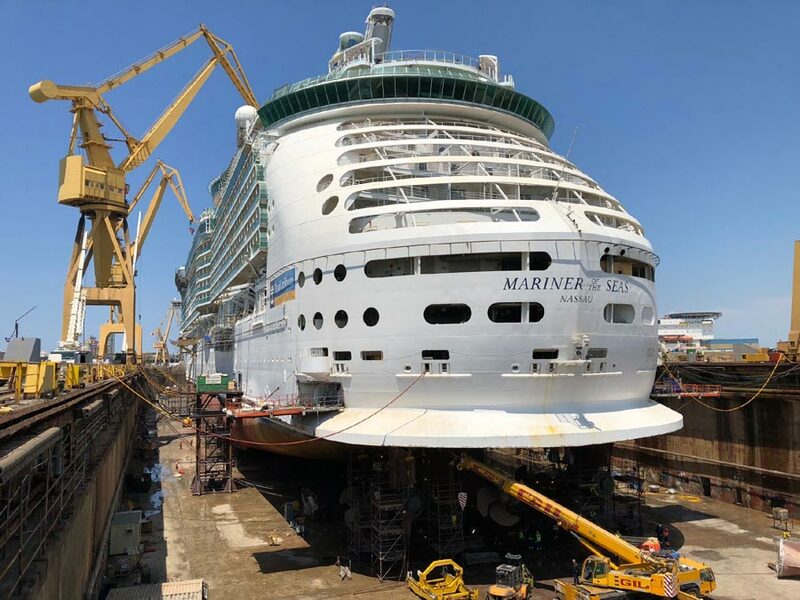 Once the dry dock is complete Mariner of the Seas will head across the Atlantic to begin a new service out of PortMiami, Florida. The updated ship will begin offering 3-night and 4-night cruises to the Bahamas. 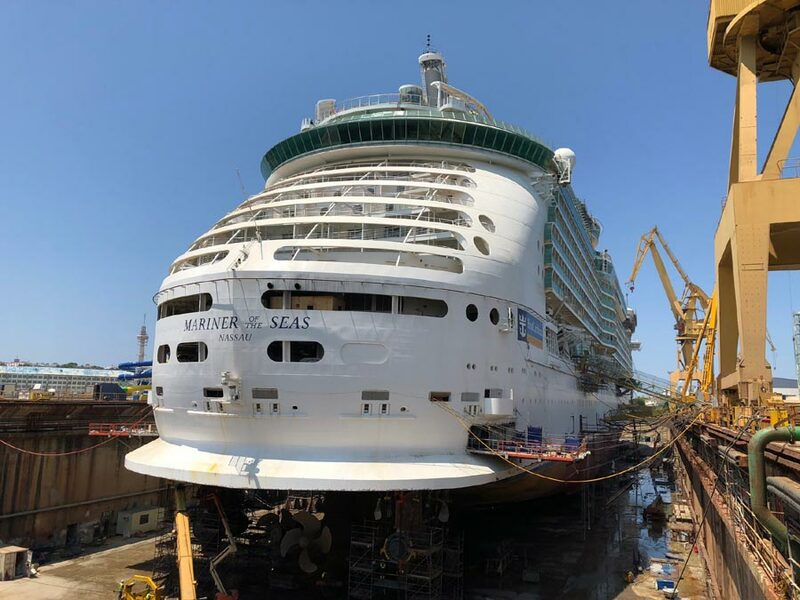 These new short sailings will begin on June 25, 2018.